Let's first define "living". A living thing is an object that shares some traits with other living things, e.g. it has a metabolism, it has been "born" (in the broadest sense, including cell division and so on) and it changes throughout it's lifetime and will, eventually, someday die. Imagine you see a picture of a tiger: You instantly recognize it being a living thing, more specific: Something you call "tiger". You have seen tigers before (or at least heard of them and saw pictures or so). You have somekind of (vague) concept of what a tiger might be and this thing fits percectly in it. And you know that a tiger is a living thing and you believe that what you see is a tiger: So you believe that the thing you see is a living thing called tiger. Then, a bit later, you see a picture of a Nasobēm. You've never heard of that before (if you did, assume you didn't). You have no concept at all of what a Nasobēm is. You haven't heard anything from it and still you somehow see: It (might be) and it is very like to be a living object. Still, you haven't seen anything resembling something Nasobēm-like ever before in your life. What exactly are the features we all recognize living things kind of acurate (even though when they don't exist in reality and are, just like the Nasobēm, just imaginary animals someone invented)? Of course, these are not perfect algorithms, but just kind-of-okay-heuristics, meaning, their result might not be perfect, but it's good enough for "everyday-usage". But still: It has to rely on things that we ourselves observed and considered "living", but what phenomenons do we actually use? Remember, this is just a still-picture, you cannot see anything moving (which might be an indicator for living things in one way or another). The question is definitely not philosophy, but whatever. I also don't think you're going to get a particularly interesting answer; we spend early childhood being shown a huge array of animals, and we get pretty good at telling when a new object is similar to an animal we've seen before. Most vertebrates have roughly similar structures (eyes, a head, limbs) and textures (fur, feathers, skin) which aren't similar to most non-animals. And there are very clear cases of our failure to recognise life (think of fungi or mould, which we have to be convinced is technically life). 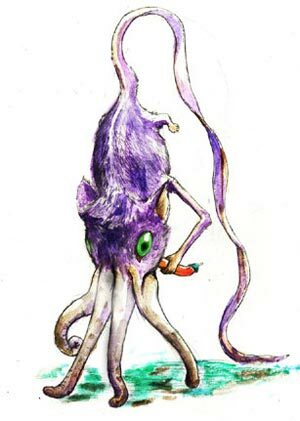 As for your specific case, it's a squid grafted onto a mouse walking almost identically to how humans walk; I don't think you should be surprised we see it and assume it's a living thing. I think it's more about experience than anything else. Mushrooms don't move. Eggs may have different forms, colors and sizes. As biologists, we run into very strange structures in a forest that we have no clue if they're alive or not. Not the answer you're looking for? Browse other questions tagged life phenomenology social-ethics perception or ask your own question. Does Husserl distinguish `sensuous contents' from 'sensuous mental processes' in §85 of Ideas I?